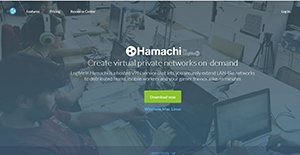 Hamachi is a cloud-hosted, professional level VPN application designed to give users the freedom to securely extend distribute teams, LAN like networks, gamer friend, and mobile networks anywhere, at any time. The platform makes it easy to manage your options for instant and managed networks. It offers three networking modules which include; Gateway Virtual Networking, Hub and Spoke networking and the Mesh networking. LogMeIn Hamachi has a great suite of features which include; on-demand networking, manage and restore networks, centralized software deployments, and unattended access. The software offers embedded security features which enable you to encrypt communication, centralize access control, and configure client/network management. The platform is also designed to help you to create and maintain your virtual private network easily and is downloadable for all major devices including Windows, Mac, and Linux. LogMeIn Hamachi is a reliable application that makes it easy to offer a convenient LAN like connectivity to colleagues and friends wherever they are in the world. It’s a robust application that features a good suite of functionalities which ooze simplicity in creation of peer to peer VPN. Setting up and managing your network is a breeze, the network ID can be supplied to up to five friends/users who may install the client app and join your network. LogMeIn Hamachi is an excellent application if you want access to a remote computer(s) while on the go. It offers reliably flexible file sharing capability and features a cloud storage feature. The software gives you the freedom to access the remote machine from the client’s app or via the LogMeIn site in any browser. It establishes a secure connection over the internet that imitates a local area network. This creates an excellent channel to help your tech-challenged employee, friend, or relative even when you are away from the office or home. The application allows you to operate the networks without the fear of data leaks. It embeds security to ensure encrypted communication using the AES 256 bit encryption. Whether you are on public or private networks, LogMeIn Hamachi helps you operate securely. Also, the software gives full control to the network usage and access. As the administrator, you will manage passwords, network authentication, and ongoing membership. If you are interested in Hamachi it could also be beneficial to examine other subcategories of Best VPN Services listed in our database of SaaS software reviews. There are well-liked and widely used systems in each software group. But are they necessarily the best fit for your company’s unique requirements? A popular software solution may have thousands of users, but does it present what you require? For this reason, do not blindly shell out for popular systems. Read at least a few Hamachi reviews and think about the aspects that you want in the software such as the cost, main features, available integrations etc. Then, choose a few apps that fit your needs. Try out the free trials of these products, read online reviews, get explanations from the vendor, and do your homework thoroughly. This exhaustive research is sure to assist you select the most excellent software application for your firm’s unique wants. How Much Does Hamachi Cost? We realize that when you make a decision to buy VPN Services it’s important not only to see how experts evaluate it in their reviews, but also to find out if the real people and companies that buy it are actually satisfied with the product. That’s why we’ve created our behavior-based Customer Satisfaction Algorithm™ that gathers customer reviews, comments and Hamachi reviews across a wide range of social media sites. The data is then presented in an easy to digest form showing how many people had positive and negative experience with Hamachi. With that information at hand you should be equipped to make an informed buying decision that you won’t regret. What are Hamachi pricing details? What integrations are available for Hamachi? If you need more information about Hamachi or you simply have a question let us know what you need and we’ll forward your request directly to the vendor.